The man had sworn never to use the Presidential Gulfstream Jet. He claimed its purchase by the NDC government was shrouded in mystery and that until the mystery was unravelled, he would not travel with it. So since he became president three years ago, Kufour has been using commercial flights for the 77 foreign travels that he has so far undertaken, flying first class, of course. And his entourages have been very large indeed, sometimes as many as 50 people on the delegation. 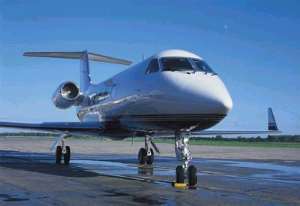 Then on March 24, 2004 the man used the Gulfstream Jet. The occassion for the journey to La Cote d'Ivoire was a peace mission which he even failed to secure for the Ivorians.